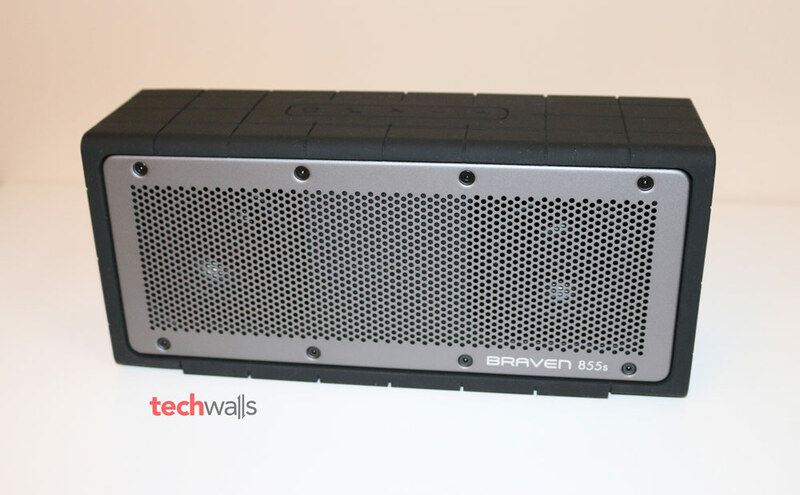 Although the Braven 855s wireless speaker was released late last year, I was still so excited when I received the product to review on TechWalls. It is because this is still among the most expensive portable speakers on the market (MSRP is $299), and honestly I am not satisfied with sound quality of all portable speakers I’ve ever used. 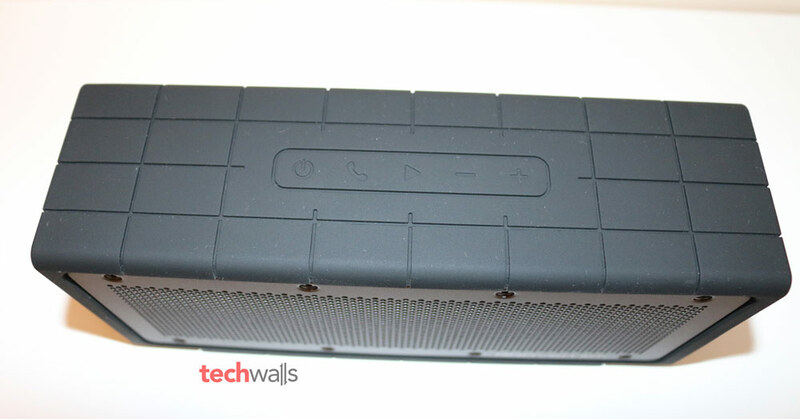 Let’s check out the Braven 855s to see if it really deserves its high price. The package of the Braven 855s includes the speaker unit, wall charger, universal plug adapters, AUX cable and user guides. I’m very amazed with build quality of the speaker, it has an industrial design with aircraft grade aluminum body and rubber covering the whole sides. The front and back of the speaker sports thick metal grilles, they look identical and you just can distinguish between the front and back by looking for the logo which only appears on the front. I really love the solid build quality and tough design. The speaker features a shock-absorbing and IPX3 water-resistant feature, which means it would be safe from small splash and rains, so you will be more confident when bringing this speaker to the beach. All control buttons of this speaker are put on top, including power, accept/end phone call, play and volume up/down buttons. If you are wondering where all the ports of this speaker are located, they are hidden under a rubber gasket on the right side. Here you can find the battery life indicator along with a battery check button, a USB-out port to charge your mobile devices, an auxiliary port and a charging port. I really love the battery gauge feature, it will show the current battery level with 5 LEDs, each represents 20% of remained battery. 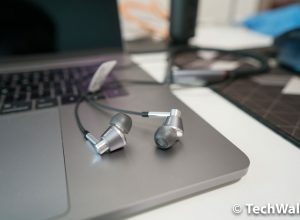 The speaker features an 8,800mAh battery which can help me enjoy music for around 14 hours at very loud volumes (and up to 20 hours according to the manufacturer). This is among the longest battery life on a portable speaker ever. Besides, you can also charge your smartphone or tablet through the USB port (up to 2.1A output), that means you won’t need to buy another high-capacity backup battery. 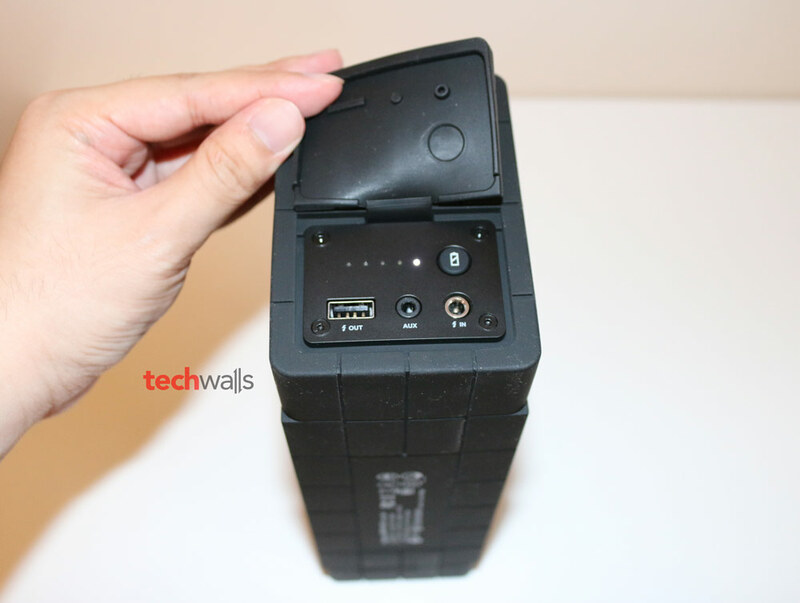 However, there is a downside of this huge battery, it requires its own AC adapter to charge the speaker, you won’t be able to charge it via USB cable. A full charge will take more than 5 hours. I love everything about this design. 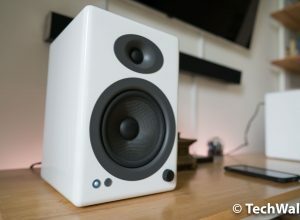 Many people complained that the speaker is too big and heavy, yes it is true. The speaker weighs over 3 pounds and measures 9.5″ x 2.75″ x 4″, it is not really a portable speaker because you can’t put it into your pocket. It will fit in your backpack but I hate putting more weights on my shoulder. I find more of its usages when I go on a long trip, go to the beach or just around my house and garden. Of course I prefer a lightweight speaker, but I understand that we can’t have a great sound and lightweight design at the same time. 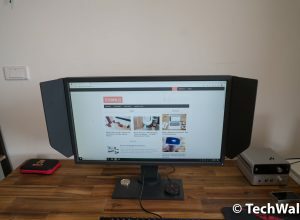 So, let’s read on to see if the heavy speaker really sounds better. As I mentioned earlier, I’m not impressed with sound quality on portable speakers like UE BOOM or Beats Pill. The UE BOOM is a good balance between lightweight design and sound quality but it is still far from satisfaction. 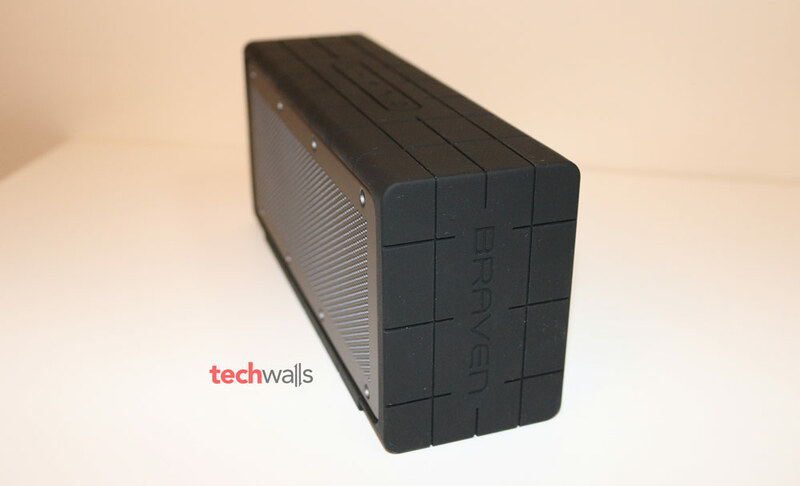 How about the Braven 855s? My answer is that the speaker sounds better than all those portable speakers I tried earlier. I tried playing different music genres in the last week and I must say the sound is much more enjoyable. It is not a flat and thin sound anymore. Instead, I really can feel the bass punching, and there is no distortion at very low and high notes. There are just some distortions when I played some heavy tracks like the ones in Pink Floyd’s “The piper at the gates of dawn” album. Otherwise, the speaker performs really well in other tracks. Besides, I see that the treble sound is not really bright, probably because the speaker’s size is still too small. Anyways, the overall sound is very loud and vocals are super clear. The better sound is the result of aptX technology and a 20W stereo output with 2 big drivers on the front. Although the two drivers are placed quite close together, I still can see that the soundstage is significantly improved. You can also pair two Braven 855s speakers together to create a real stereo sound and I believe the sound will much more impressive then. Another feature of the speaker is SRW WOW HD technology which promises to enhance clarity and bass response. You can turn this on by pressing and holding the two volume buttons, however, I’d not recommend to turn this one because the sound will become so horrible. It seems to be better and I can see the sound imaging is much wider, but the sound become thinner and so vulnerable. 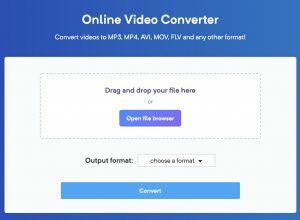 I experienced distortions very often after trying this feature. Rugged design with water-resistant feature. Solid sound with impressive bass responses. Mid-range sounds are crisp and clear. Sound is loud enough for outdoor usages. Can be used to charge other devices. Quite big and heavy for a portable speaker. SRS WOW sound is over-tweaked and so easy to distort. Rubber exterior can catch dusts easily. The Braven 855s is available on Amazon for less than $250. I’d recommend this speaker if you are looking for good sound on a portable speaker and don’t mind carrying more 3 lbs in your bag. 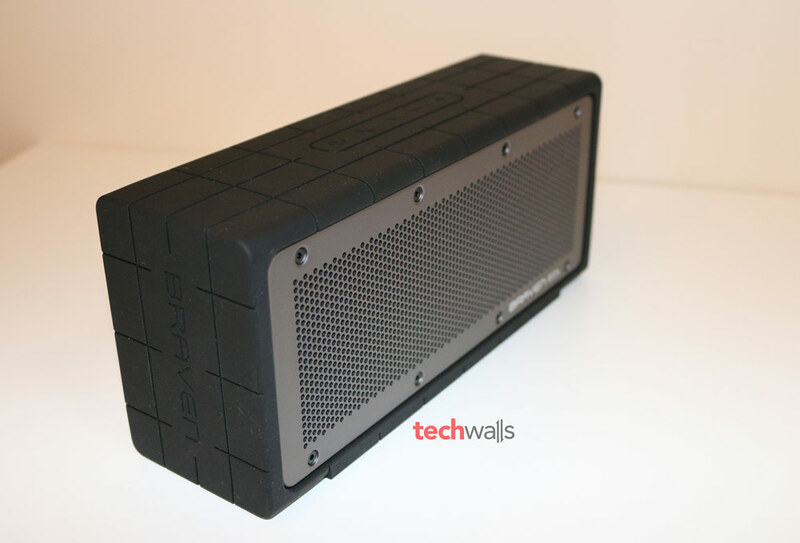 The rugged speaker will be a great companion for you in the whole summer then. A big portable speaker with beautiful sound.